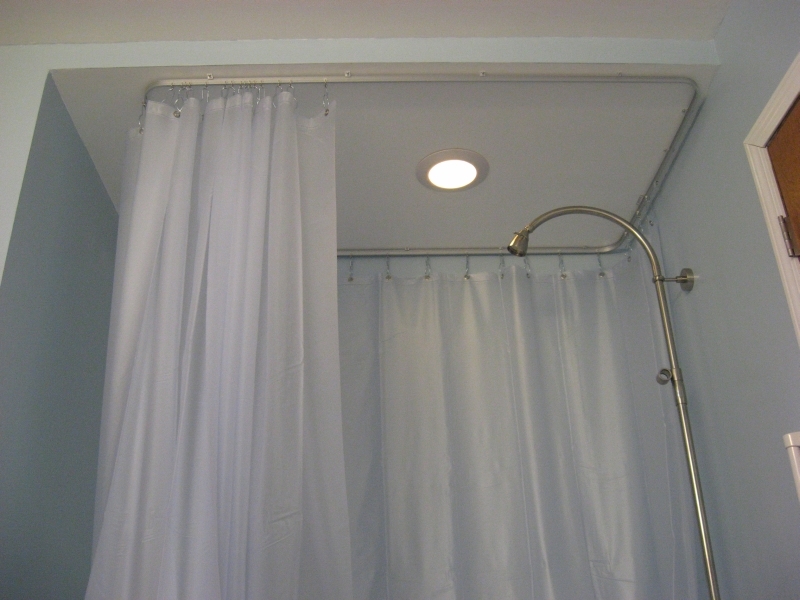 One of the great benefits of the RECMAR 4108 I-Beam curtain track (also used in the 4372 Deluxe Shower Curtain Track Kit) is that it can be bent into angles or arcs by hand without the need for any special tools, equipment, or inserts. This track can be bent to a 90 degree angle while requiring only a 2 inch bend radius. The question is often asked by customers if the track can really be bent by hand, and the answer is an emphatic yes! The most common application for this track is to be bent into a 90 degree corner section, but any angle can be achieved. Below we provide suggestions to help with the accurate bending of the RECMAR 4108 I beam curtain track into a 90 degree with a tight bend radius. 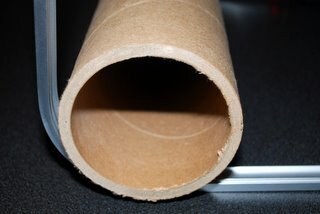 You can use the shipping tube that your track arrived in as a bend template. 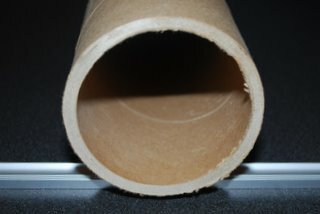 The diameter of that tube is 4 inches, which provides a sturdy guide to bend the track to a 2 inch radius (the minimum radius recommended). Any other round object (paint can, bucket, etc) with at least a 4 inch diameter (2 inch radius) can be used in the same manner as described below. Lay the track flat on its side on a level surface (e.g. the floor or a table top). Lay the shipping tube on top of the track, perpendicular to the track, locating it in the exact bend location required. While applying downward pressure on the tube to hold the track in place, grip the track close to the tube and wrap the track around the tube by lifting the track from the flat surface, extending the end of the track upwards until the desired angle is achieved. Remember that the track is going to bend around the bottom quarter of the tube (think of the track bending from 6 o'clock on a clock face around to 9 o'clock). Of course, you can also simply grab the track in two hands and bend it to the desired angle, but using a rounded object as a guide does result in a more consistent, symmetrical bend. We hope this helps you appreciate how simple and easy the bending of this I-Beam track is, and how the track maintains its strength vertically to support the carriers and curtains. 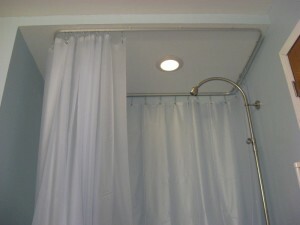 Our team is always here to provide advice on curtain track selection or installation.